Имате въпрос към Deniyaya National Motel? Deniyaya National Motel, който се намира в Ihalagama, Kotapola, е популярно място за туристи. Само на 68.1 km от градския център- това стратегическото местоположение на хотела гарантира на гостите си бърз и лесен начин за достигане до интересуващите ги точки на града. С удобното си местоположение хотелът предлага лесен достъп до всички градски забележителности, които задължително трябва да се видят. Deniyaya National Motel също така предлага много съоръжения за обогатяване на Вашия престой в Kotapola. Докато са отседнали в този чудесен хотел, гостите могат да се насладят на 24-часов рум-сервиз, 24-часова рецепция, Wi-Fi връзка в общите части, паркинг, рум-сървиз. Всички стаи се отличават с грижливо замислени удобства, което гарантира неповторимо усещане за комфорт. Освен това в хотела можете да се възползвате от множество предложения за приятно прекарване на свободното време. Deniyaya National Motel е най-подходящото място за Вас, ако търсите качествен хотел в Kotapola. отель исключительно для тех,кто настолько любит животный мир,что готов спать с пауками и прочими насекомыми! номер с такими дырами в потолке,что могут залезать все насекомые! еще на крыше птичье гнездо и всё утро они громко чирикали!в нашем домике мы увидели очень большого паука и от него было не по себе! ещё там мини-озеро и всю ночь квакают жабы! мы еле-еле уснули и долго оставаться там не хотелось! но очень хороший парень,главный из персонала.он пытался нас успокоить и дал всякие средства от комаров и насекомых) и он очень дружелюбный! но больше в этом отеле я бы не осталась!зато близко к лесу синхараджа! Fantastic place, locally run with a little bakery too. Cabañas are rustic and cute, with great views of fields and temple. Be careful as they are a little flimsy in places though! I booked this place because of the positive comments submitted by reviewers. I was visiting with my wife and my brother. Upon visiting the place I was disappointed. First the owner tried to send us to his house instead providing us the rooms we booked. I don't know what his intention was. The rooms were below average and not very clean either. The view and surroundings are not memorable. I must specially mention the food which was bad. The owner bakes bread and other items at his own bakery at the motel. It was not very good. I don't understand why people have said that the food is delicious in their reviews when it is not. Prices for lunch was outrageously high and was abysmal. I'm from Sri Lanka and what he prepared for lunch does not warrant that price. Foreigners should be aware about this. The stay at this place is not a fond memory. I'm glad that some people really enjoyed this place, but found the reviews to be misleading. First of all, the staff was very helpful, arranging tours and transportation on a moment's notice, providing food when we needed it. That was the best part of our stay here. We stayed in the two story "cabana", which is a mud hut in need of some repairs. The hut is open to the elements in many places (holes in the walls), the bed is too small to comfortably sleep two people, and although it did cool down a little at night, the room would benefit from the addition of a fan. I wouldn't recommend this place unless you are short (for the bed: we are both 5'10" and didn't fit) and really ready for a rustic experience with wildlife (insects and spiders) in your room. The cabana is also seriously over-priced. Sidney is extremely friendly and knows loads about the surrounding rainforest. He is very eco conscious and his huts are great, overlooking a beautiful paddy. It is well equiped with hot water, and a mosquito net. Sidney served us one of our best curries in Sri Lanka and has also lots of good cakes, as the hotel has it's own bakery. This is the best place to come if you are looking for insiders info about the area and rainforest and Sidney also offers projects for travellers who are looking to do voluntary work for the preservation of the rainforest. His hotel will also be expanded with a terrace in the future, overlooking the ricepaddys and a beautiful area to watch the sunset. The staff (Sidney) was very knowledgable about the local area and pointed out great things to see. The food was great. We had a great stay. The rooms are very small and rustic but are priced accordingly. The service from the staff was very good. Extremely friendly staff with a campaign to protect the rain forest, natural huts with great scenes and atmosphere, bakery inside with delicious products. We stayed 2 nights. Delicious food in large portions. The owner and the staff is extremely friendly. The rooms are swallowed in nature and they were the most natural rooms that we have stayed. Everything was fine, but the bed was too small for two persons, especially for tall person like me. Sinharaja is definitely worth visiting. The owner was extremely knowledgable about the area and passionate about the rainforest. He took care of tour arrangements. Food was very good. My boyfriend and I originally planned to stay here for just two nights, but ended up doubling the length of our stay because we enjoyed it so much. Sydney the owner was fantastic, and gave us loads of great advice about places in the area that we should go to make the most of our time. He helped us to get the best prices for tuktuks and guides at Sinharaja NP as well, and was generally very accommodating, going as far as to wake up extra early to give us breakfast before we went out birdwatching at 6am! The cabanas are lovely too.. Rustic, and fairly basic in terms of furnishings, but homely and very cool (due to them being mud-walled). The best thing about the area is the abundance of wildlife in the garden and around the cabanas. If you're scared of spiders it may not be for you, but we were buzzing on the numbers of butterflies, iguanas and frogs that we saw in our time at Sydney's place. 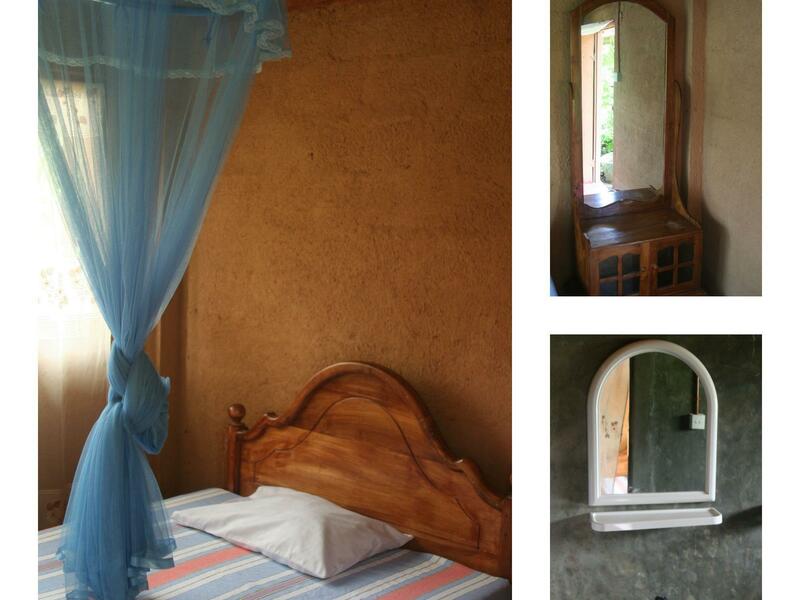 The mud huts we stayed in, were new ones, not the round ones on the pictures. They were in a nice condition, the bathroom looked clean and new. But since this is a mud hut right next to an open field, there are ants and other insect everywhere, which one should be aware of. 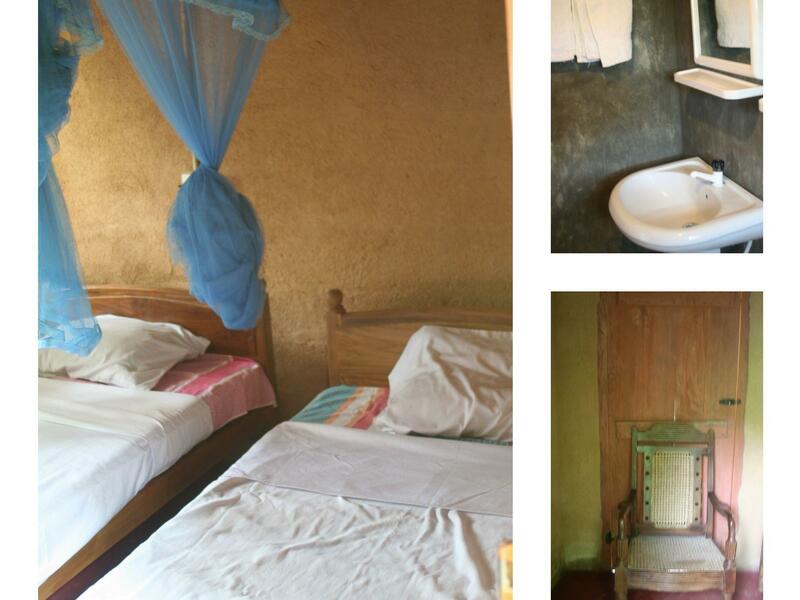 There is also no hot water, the round huts come with hot water, but they are more expensive. At night you should be ok with loud wild life noises, like frogs and crickets. Also, be aware, that some large spiders might come in when it get's dark - so if you are arachnophobic, this might not be the best place. We enjoyed it, as it was a little wildlife adventure. Real eco friendly, owner a real lover of nature and especialy the rainforest. Very nice. Eco room. If you come for upclassed comfortable rooms, don't go. If you want a nice experience connected to eco and the rainforest....go. The manager Sydney is one of the nicest man we ever met. He helped us with everything (bus, visit of the forest, etc.) and was really interesting to talk with on lot of different subjects (environmental protection, work etc.). He loves the forest and plans to open an organic farming. The cabana are rusting but the place is so lovely that you forget about it. Sleeping in the middle of rice field is really a good experience, feeling the rain falling on the roof is great. If you come here,it's great to go to Sinjaraha forest, where you can see a lot of animals. Just be aware of the leeches, but the salt on your socks and shoes help a lot. Thank you for the nice stay Sydney. Good luck in your projects. This is an up and coming place and I am sure that it will be full I just a few years. The owner has big plans for it´s future and is one of the nicest persons we met on our trip. He is very keen to make his guests fell comfortable and help them with everything from arranging trips to find a raincoat. The food is traditional and cheap, and he also has a small bakery with the tastiest creations. 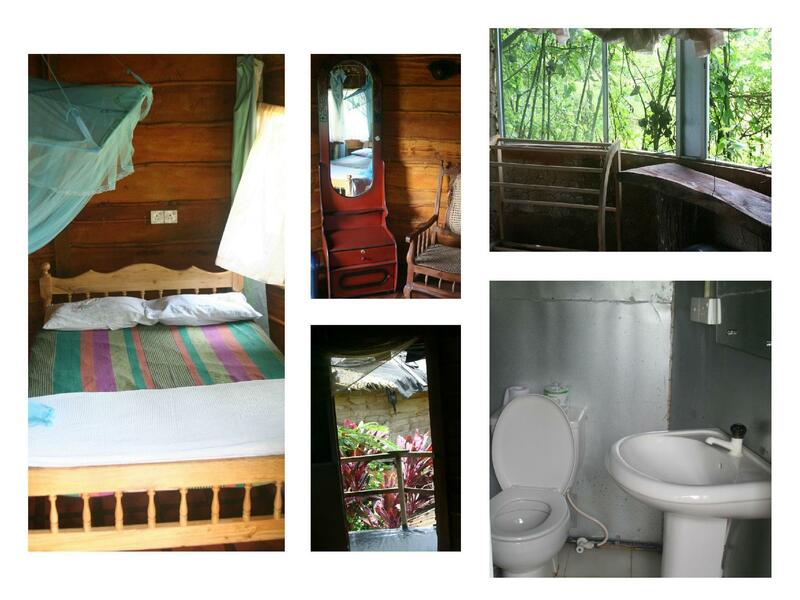 The mud-cabins have a lot of charm and are really cozy to stay in during the massive rain-attacks. But, as he says “Don´t expect a five star hotel”, this place lay’s in the middle of the rainforest and you have to be aware of the fact that there might be animals cheering space with you (we had one or a few rats in our cabin, but he said he would fix that by building a new roof) and that rainy days makes stuff a bit muddy. Overall: this was one of the best experiences we had on our whole trip, if you are a nature lover, don’t hesitate to book a cabin here before it´s all famous and crowded! Owner, Sydney was very helpful in arranging walks at Singharaja Rain Forest, a UNESCO park. He arranged all the transportation and guides for my jungle walks. The cabana rooms were really cool traditionally built mud huts set in the middle of the garden. The owner was always very kind and friendly and able to give good suggestions. The bakery/restaurant. The Deniyaya National Motel was the probably the coolest hotel I stayed in in Sri Lanka. The cabana rooms were traditionally built mud huts set in the garden, with great views of farm land and great for watching wild life right from your balcony. The rooms, while being very traditional have all the amenities of a normal hotel room: hot water shower, clean bathroom, mosquito net, desk, and terrace. (my room did not have a fan (it was newly opened) , but I think the owner plans on getting standing fans in the rooms soon. Staying out in the "jungle" was pretty neat, and I really liked it! The owner of the hotel is one of the nicest guys I met on my trip. He was really helpful and really nice. He worked in the UK and his English is perfect and he grew up in Deniyaya so he knows a lot about the area and the wild life. I enjoyed every waking hour in this hotel. It is important to remember, however that the cabanas are set in the garden near a farm and not far from the rain forest so there are insects. The mostly didn't bother me, but a few got under my mosquito net and ate me pretty good. Also there is so much wild life and so many birds in the area and they might hang out on your roof, don't worry, they won't get in the cabana, but they will make some noise. The hotel bakery/restaurant is usually full of locals enjoying the food which is probably the best recommendation I could think of for the quality of the food there. All of this makes the Deniyaya National Motel feel like an adventure, while having all the good things of a normal hotel.